Delhi is filled with a wide variety of markets. We have Sarojini, Lajpat, Janpath, Karol Bagh and the list is endless. But one of the lesser known markets is the Kamla Nagar Market. Based in north-campus of Delhi University, this place caters to all the basic needs of a student. Not just for clothes but also stationery and most importantly FOOD!! To make your trip easier, we’ve decoded the entire market into the following 4 categories. You can get cheap stuff at markets like Janpath and Sarojini but Kamla Nagar Market is insanely cheap. Of course you need to have good bargaining skills but otherwise too, you’re good to go. You’ll get massive variety in shirts, t-shirts, ethnic wear, pants, shorts and what not. Usually flea markets are women centric, but this place caters to the needs of both boys and girls. The middle-eastern trends are really dominating the junk jewellery markets. You’ll be able to spot all these Afghan chandbalis, jhumkis, mirror work rings and neck pieces, pom- pom danglers and anklets here. You can also buy first copy watches and sunglasses. Kamla Nagar market is majorly known for footwear it has to offer. They usually have all the trending shoe designs and if you’re lucky, you might actually get a pair of original Vans for less than 800 bucks! Not just this, during the winters you can find various styles of boots here both for men and women. Since the market is situated in the heart of the university campus, there are a lot of shops from where you can buy notes for your desired courses. Yes! You read it right. You can buy notes and if you’re one of those who make their own notes, then you can sell them too once you don’t need them anymore. Also, there is a small shop in the alley where you can find every stationery item possible. If you’re a person who digs street food then this market is your paradise. 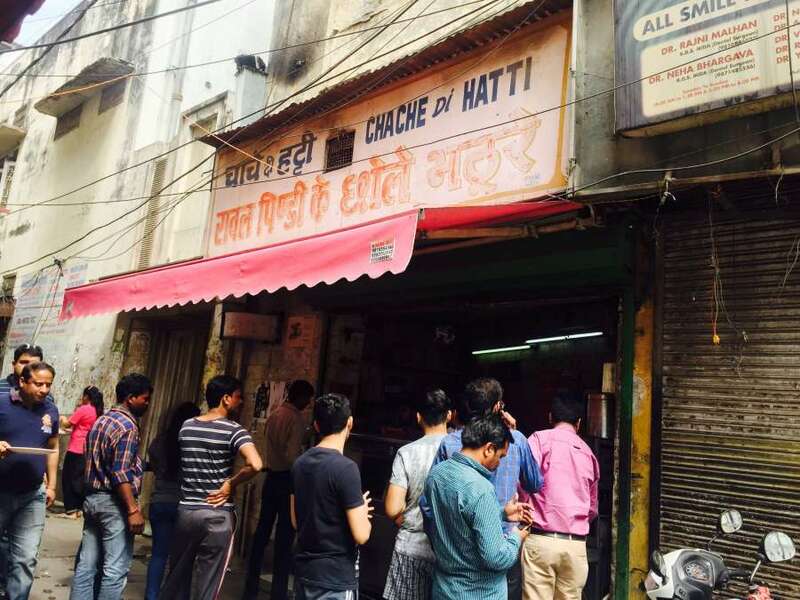 Chole puri from Chacha di Hatti is famous all over Delhi. There are other finger licking snacking places such as momos point, Bittoo Tikki Wala and Vaishnav ki Chaat for you to choose from! No Way Can Ignore This Hot Choco Fudge Sundae For A Monday Kickstart!